The Stars and Stripes—we see them waving over public buildings, political rallies, car dealerships, but how often do we really look at our flag, much less consider its significance? People sometimes seem to find patriotic fervor a little embarrassing, as if celebrating our national symbols will infect us with mindless chauvinism. But symbols are powerful, and the flag is one of the most important. As defined in the Great Seal, Red is for hardiness and valor, White is for purity and innocence, and Blue for vigilance, perseverance and justice. The stars are for the states, the stripes for the original thirteen colonies who dared to bet their survival on the belief that a democracy based on equal rights could work. The flag cannot be claimed by any single political movement or party—it represents us all. 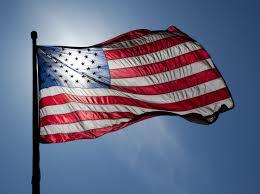 The American flag is the pre-eminent symbol of our country. 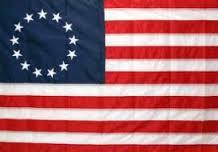 It is the flag under which the men and women of our Armed Forces have fought and died. It is up to us to make sure that their sacrifice was not in vain. Of all those who have said the Pledge of Allegiance, it is our newest immigrants, who have often survived many dangers to reach this land, who probably take those words most seriously. When we recite the Pledge of Allegiance we are taking an oath, accepting the obligation to support a united country in which liberty and justice are the right of all. The next time you see the flag, take a few moments to think about what that means, and what you can do to make it so. As an affirmation, try repeating that last phrase. If enough of us do that, maybe the national consciousness will awaken to an awareness of its meaning. To connect with the Founding Fathers, some use the “Valley Forge” flag, whose field bears a circle of thirteen stars, as a focus for meditation. One can move through the circle to contemplate a particular concept or issue. *”under God” was added as an anti-Communist statement during the height of the Cold War. Some pagans pluralize “God”, and atheists or agnostics may skip that phrase altogether. The Founding Fathers often used “Providence” to refer to the Supreme Being.